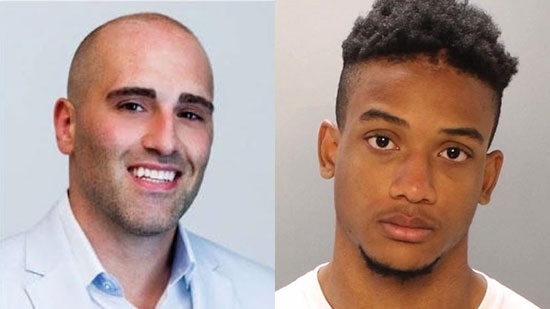 At a preliminary hearing on Wednesday morning, 8/1, Philadelphia District Attorney Larry Krasner withdrew a charge of first-degree murder against a man accused of fatally stabbing a real estate developer near Rittenhouse Square last month. 20-year-old Michael White is now charged with third-degree murder and voluntary manslaughter in the death of 37-year-old Sean Schellenger. The incident happened before 11 p.m. on July 12th at 17th Chancellor and 17th Streets. White's bail as been set at $150,000. He would be placed on house arrest if he posts bail. His next hearing is on October 30th. Supporters of White believe he acted in self defense during the confrontation with Schellenger and at the very least had hoped for this reduction in charges. A homeless man that attacked a librarian and stole a donation jar full of change from a library in Darby has been found and arrested. 40-year-old Terrell Carter was arrested near Broad Street and Lehigh Avenue in Philadelphia around 11 a.m. on Tuesday, 7/31. He is charged with assault and robbery and is being held on $500,000 bail at the Darby Borough Police station. On July 12th, Carter stole a donation jar full of $200 in change from the Darby library. As he was fleeing, Carter knocked 60-year-old librarian Joyce Anderson down the stairs. She suffered multiple fractures including her hips, pelvis, tailbone, and two vertebrae. She is still recovering in the hospital and has just started therapy. There was an intense manhunt to find Carter who was known to frequent libraries to use the computer and prey on the elderly to fuel an online gaming habit. The first member of a former Penn State Fraternity who pled guilty to charges related to the death of pledge last year was sentenced on Tuesday, 7/31. 21-year-old Ryan Burke of Scranton had pled guilty to four counts of hazing and five alcohol violations. Centre County Judge Brian Marshall sentenced him to three months of house arrest followed by 27 months of probation. He was also fined more than $3,000 and ordered 100 hours of community service. 19-year-old Timothy Piazza died as a result of injuries suffered following a night a heavy drinking during a pledge acceptance ceremony at the Beta Theta Pi house in February 2017. Burke was the rush chairman and was shown on video walking around with a bottle of vodka to give to pledges and supply them in a drinking 'gauntlet.' He had initially been charged with involuntary manslaughter, aggravated assault, simple assault, and reckless endangerment but those charges were either dropped by the DA or thrown out by a judge. The other fraternity members are either awaiting trial or pretrial hearings.